Lawn mowers require routine maintenance to prevent damage and to maintain cutting precision. Mower blades that are dull or have become worn down may cause an uneven cut when running along the yard. One aspect of mower maintenance often neglected is the leveling of the mower deck; if the deck is not leveled, the blades may cut unevenly. Leveling the mower deck at the beginning of the mowing season can give you a whole season of even cutting. Engage the parking brake and disengage the mower drive. Unplug the spark plug wire to prevent the mower from starting while working on the machine. 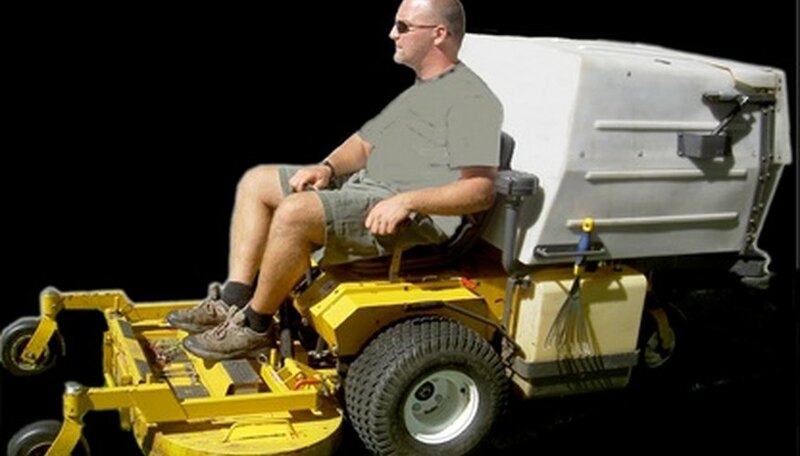 Place the mower on a level surface such as asphalt or in a garage. Smooth surfaces are best. Position the mower deck in the highest position. Adjust the tire pressure so that all tires are evenly inflated to prevent miscalculations of height. Position the mower blades so that they are pointing toward the sides of the tractor. Measure using a ruler from the edge of the blade to the pavement, noting the position on a piece of paper. Subtract the two numbers to get the height difference between the two blades. No adjustment is needed if the difference is 1/8 of an inch or less. Turn the lift link lock nut, positioned just before the rear wheel on the side requiring the height adjustment. Each full turn moves the deck 3/16 of an inch. Adjust as required on each side before doing a front to rear adjustment of the deck. Turn the blades so that they are facing toward the front of the mower and measure the difference between the blade and the pavement, subtracting for the difference between the two blades. Loosen the jam nut located at the front of the mower deck several turns to expose the adjustment nut behind it. Turn the adjustment nut to move the mower deck up and down as required. No amount of adjustment will compensate for bent blades. Replace bent blades or have them repaired and sharpened.